The Toronto design firm layered funky lighting, art and furnishings over a historic building in a trendy neighbourhood to create a lively interior for Generator Amsterdam. 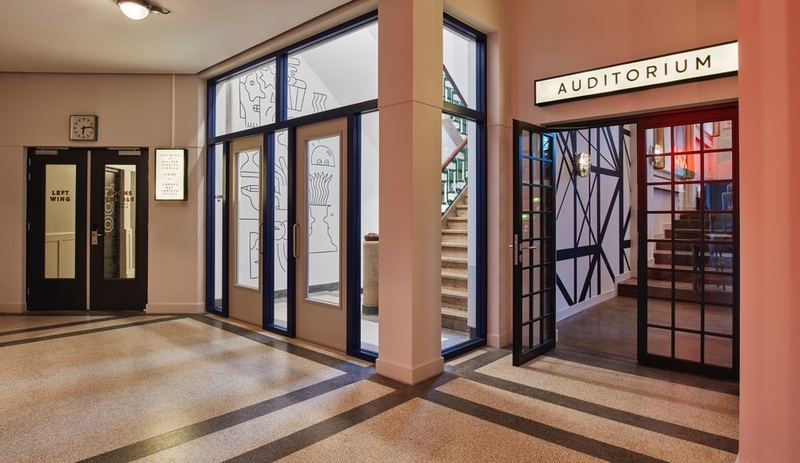 Generator Amsterdam is the 10th in the brand’s series of high-end hostels, and its most monumental so far. 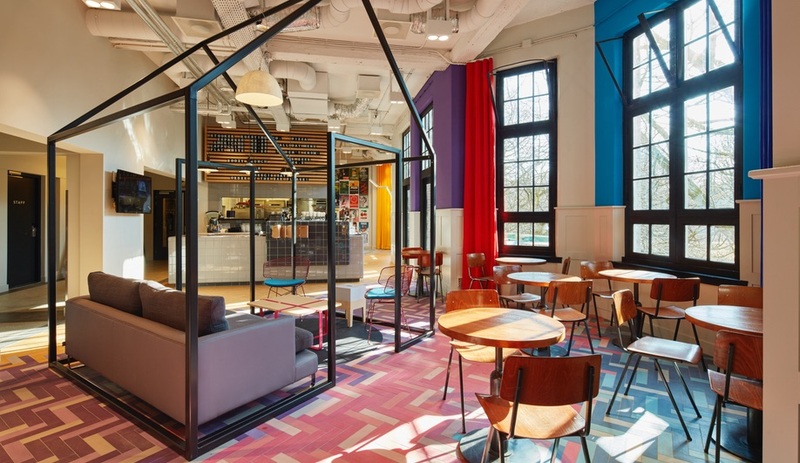 As in most other Generators, the Amsterdam location’s interior was put together by DesignAgency of Toronto (on this occasion working with local firm IDEA Ontwerp). 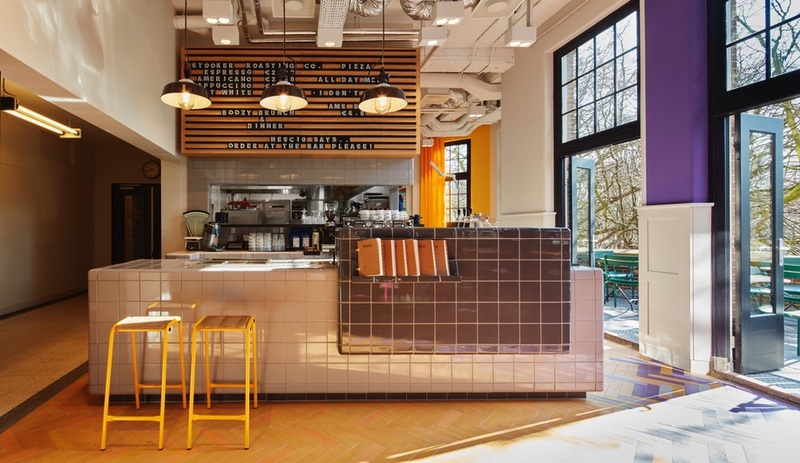 Some aspects of the project hew close to the brand’s other locations – a design-first approach that encourages social encounters, for example – but other moves place Generator Amsterdam in a class of its own. 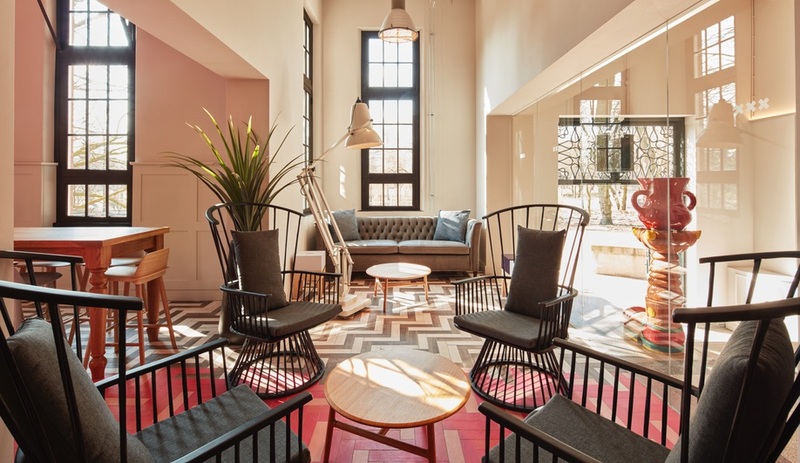 At 168 rooms, the hostel’s size is one thing that sets it apart. 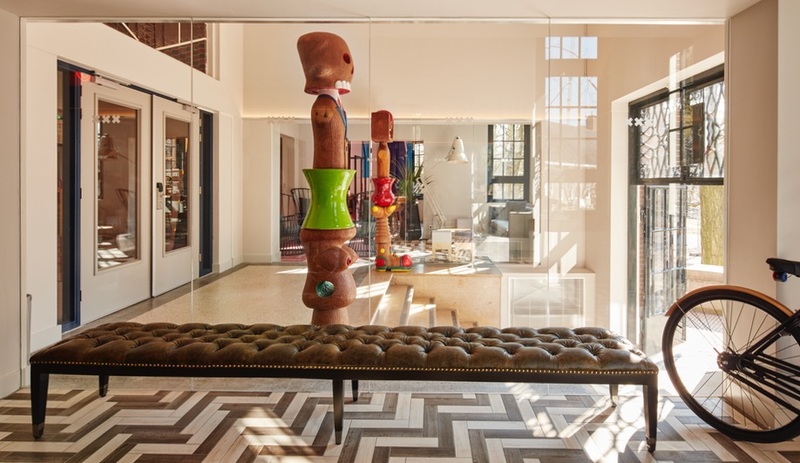 It occupies a century-old brick edifice in Amsterdam’s trendy Oost neighbourhood in the southeast corner of the city, home to some of the area’s best galleries, shopping, bars and restaurants. The building sits on the edge of Oosterpark, a large urban park that includes massive monuments and a playground area. 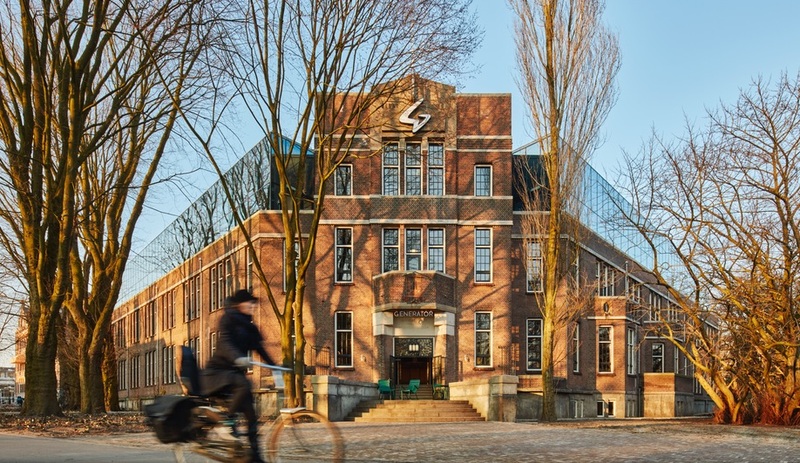 The character of this former health sciences building and zoological museum has changed very little on the exterior, but inside it’s a whole different story. 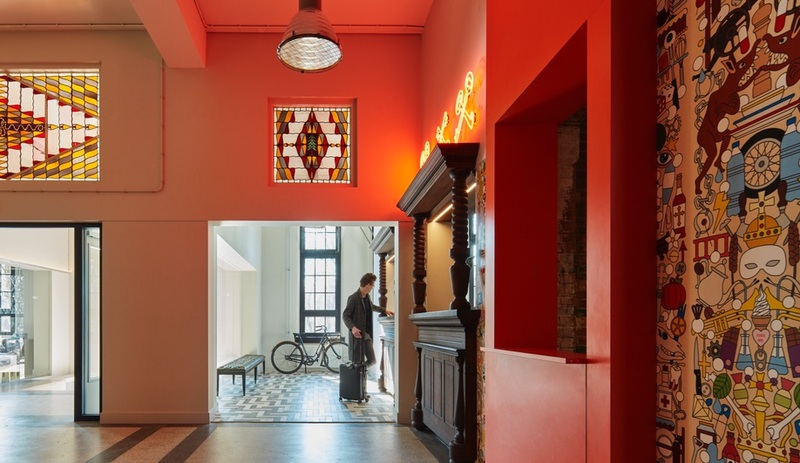 To give the hostel its trademark Generator hipness, while still letting the architectural strengths of the historic building shine through, DesignAgency used a layering strategy. 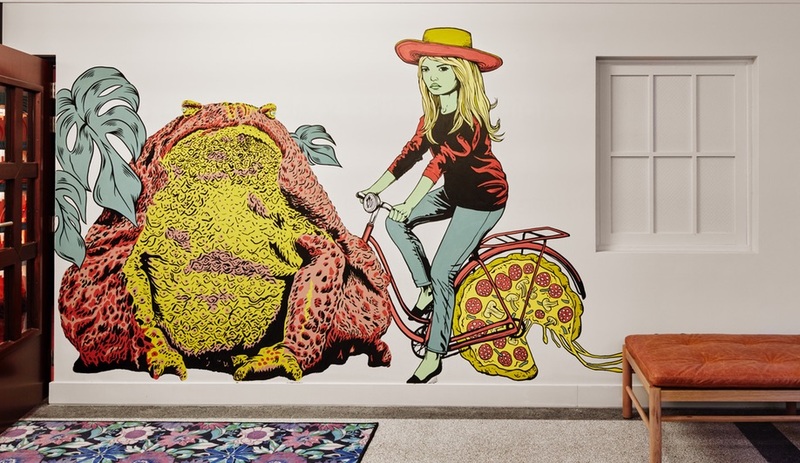 Some spaces in the hostel are historically protected, so the original structure was preserved, then overlaid with funky murals, contemporary furniture, distinctive lighting and plenty of art, much of which makes reference to Dutch culture. 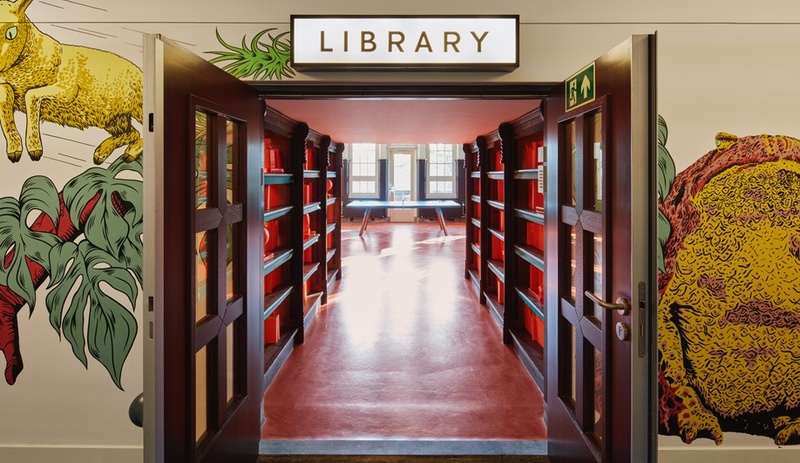 The check-in desk, for instance, is marked by three sets of crossed keys in red neon; the Xs evoke the city of Amsterdam’s logo, while the red neon alludes to its infamous red-light district. 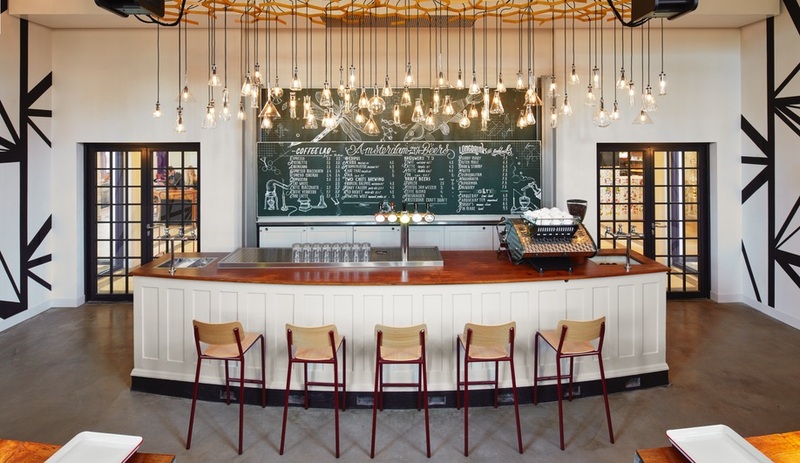 Lighting is key throughout the interior: the project includes hundreds of light fixtures reclaimed, restored and redesigned by Blom & Blom, an Amsterdam/Berlin company that salvages light fixtures from abandoned East German factories. Using glass labware recovered during the renovation, Blom & Blom even created a new chandelier for the bar, which is a focal point of the entire project and occupies the apex of the V-shaped building. 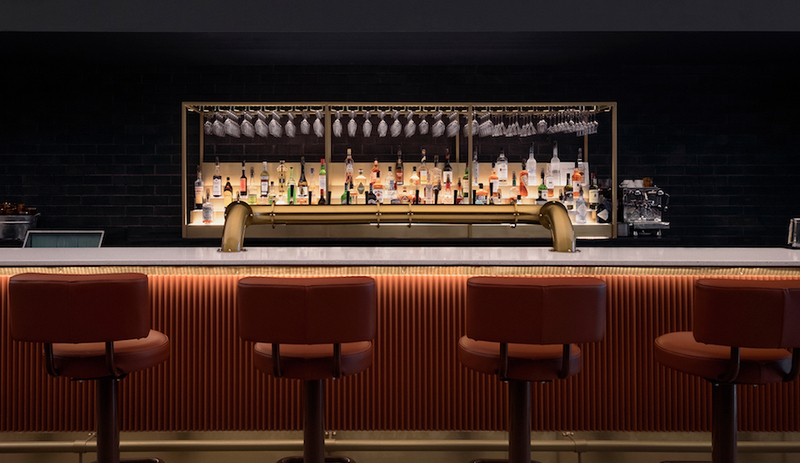 Located in the former auditorium, the bar includes three separate lounge areas: one comprises the existing rows of tiered seating with trays and individual reading lamps, one overlooks the bar from a mezzanine overhead, and one, suspended on a galvanized steel frame, acts like a catwalk, linking all these spaces. “The auditorium was sanctioned off as a prime heritage room, so we had to present all our ideas for approvals,” Mekhayech says. 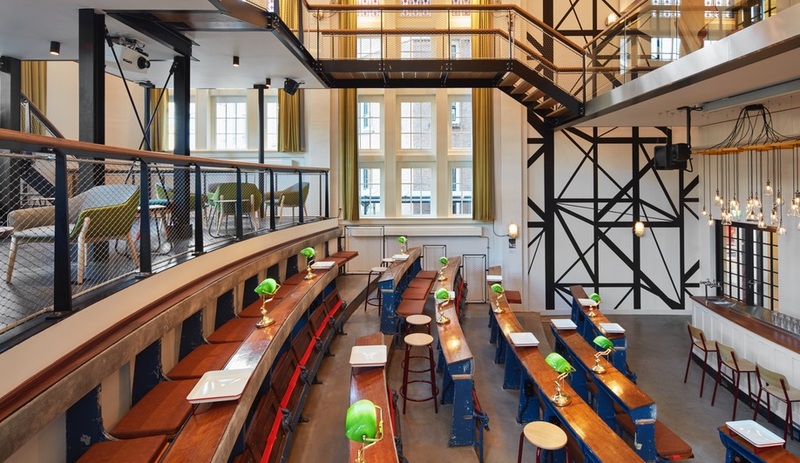 “We were inspired by the Lloyd Hotel to add the amazing structural mezzanine that connects the auditorium with the library.” At the front of the room, where the lectern once stood, the bar itself features beer taps and an espresso machine, and repurposes the existing blackboard to display the drinks menu. 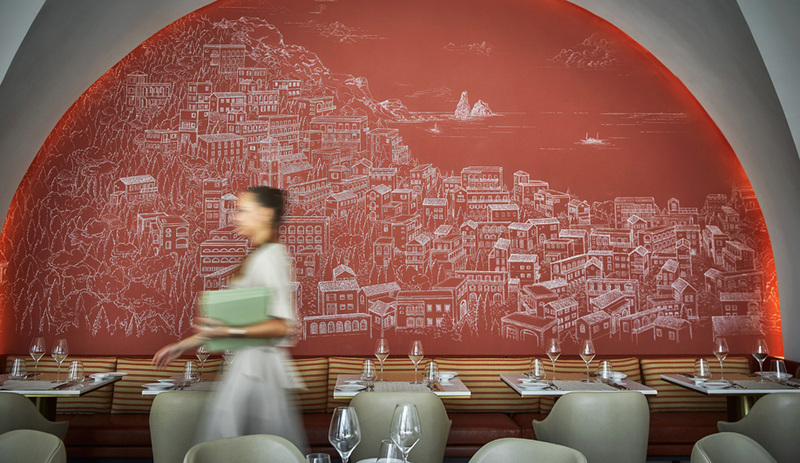 Other similar touches enliven spaces throughout Generator Amsterdam. 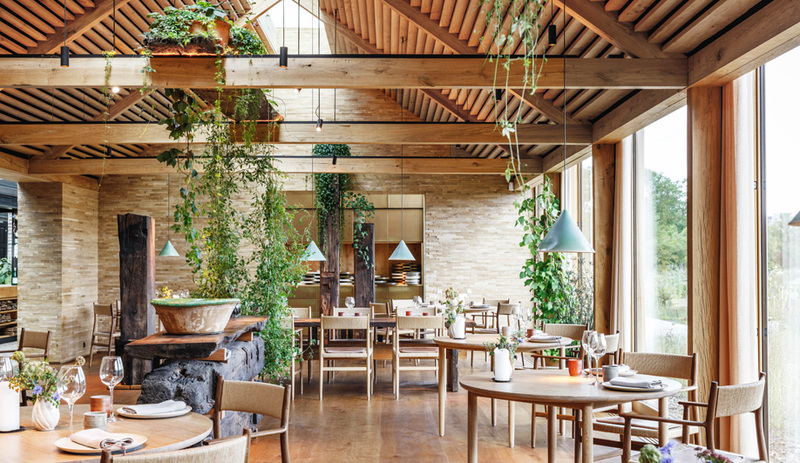 In the cafe, for instance, abstracted house-frame shapes divide the interior into intimate spaces while maintaining transparency and sight-lines, and a floor of brightly coloured tiles pays homage to Holland’s famous tulip fields. 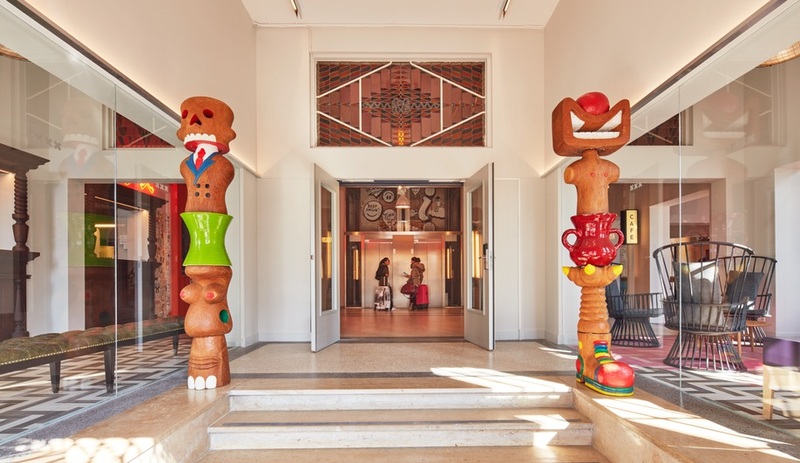 At the entrance, the original marble staircase and stained glass transom above it were preserved, but today, new totem-like sculptures in ceramic and wood by local artist Hans van Bentem add signature flair. 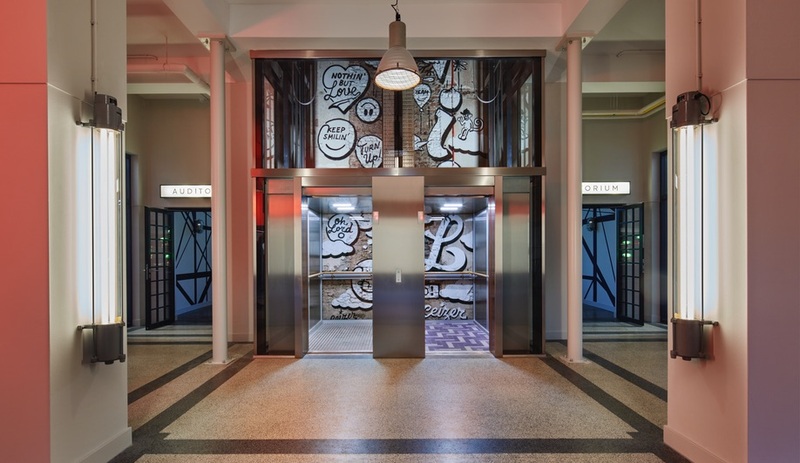 Even the elevator shaft received an injection of fun: muralist Pieter Ceizer lined the shaft with playful graphics, prompting DesignAgency to install a new elevator with glass walls, treating riders to ever-changing views. While the hostel’s emphasis is squarely on the common areas, the bedrooms received their share of attention: all feature an accent wall with eye-catching Studio Job wallpaper, and the premium private rooms include blankets by textile designer Mae Engelgeer and brass Anglepoise bedside lamps. 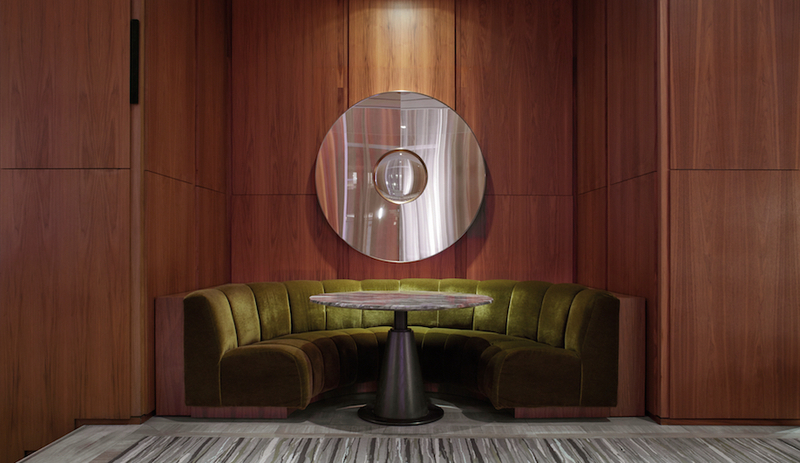 Tom Dixon’s Offcut stools – a Generator stand-by – are found throughout. One of the few major architectural changes to the building is a glass-walled addition to the rooftop, which adds two new storeys to the structure. 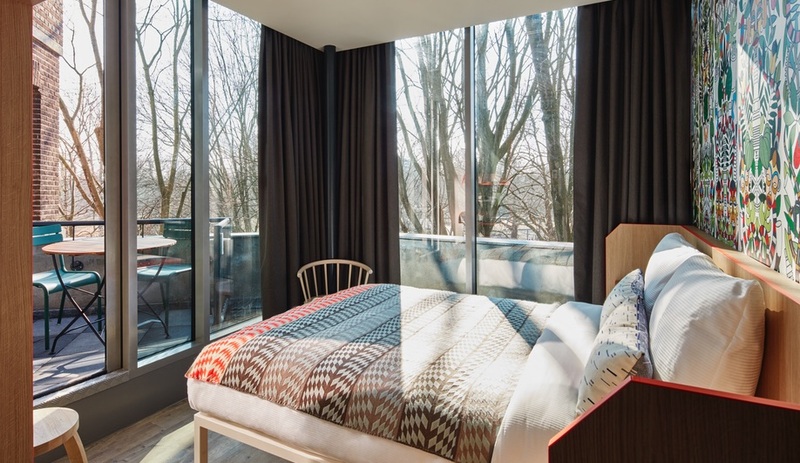 Here, suites are given unobstructed views over the treetops of Oosterpark.